Maple and Cedar classes enjoyed a visit from the RSPB when we explored our school grounds, looking at the different habitats we offered for wildlife. We then plotted this on a map and thought about next steps for helping out local wildlife. It was a wet and miserable day in terms of the weather, but we really enjoyed the activity! 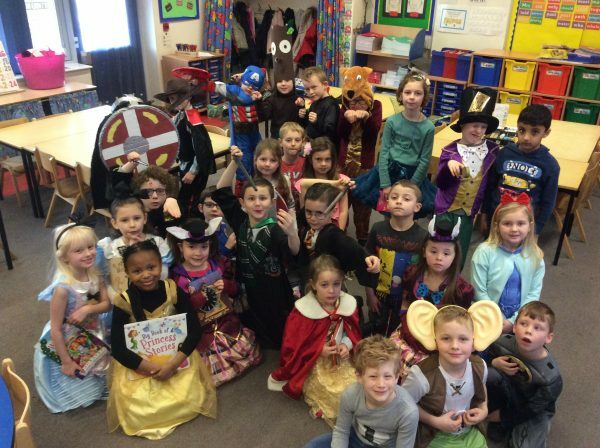 Look at all of our fabulous costumes! Continuing our theme of journeys through the air, Chestnut Class investigated how far ‘a sneeze’ travels through the air. We discovered that a sneeze can travel over a metre without a tissue but when a tissue is used it barely travels at all. We learned that to prevent sneezes/germs spreading we should always use a tissue and remember to wash our hands regularly. Chestnut class have been discussing how the air can become polluted and what causes it. Although we can’t always see it, we knew that some places have more polluted air than others. We tested two solutions, as models for ‘park’ air and ‘busy road’ air. When we added our reagent (grape juice) it became very obvious which solution was more polluted. The ‘park’ air remained clear and pink. The ‘busy road’ air became murky and changed the colour of the reagent. Chestnut class had some visitors from the Nottingham Trent University for Science week. It was great fun! They brought a digital microscope for us to look at everyday objects really closely. We talked about how teeth can become decayed by too much acid and then used special paper to test if certain liquids were acids.